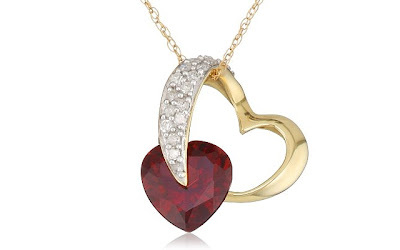 This 10k Yellow Gold Diamond and Garnet Heart-Shaped Pendant, 18" is currently selling for just $139.00 on Amazon.com! You will be saving 47% off the listed price of $260.00 with this jewelry deal. Also on sale are the 14k Yellow Gold Heart-Shaped Garnet Stud Earrings for $62.00. That's 62% off the listed price of $163.67! What I like about this heart necklace is that the gold and diamond heart looks like arms embracing the garnet heart. What a perfect piece for a Valentine's Day gift!